I have heard since I was little that I look like my father. My son has heard since he was little that he looks like me. And there are many other things that I have noticed that have been carried down from generation to generation. I visited with some family a couple of years ago, and a couple of my cousins told me that they kept looking up and expecting to see Uncle Jerry, only to see me. My Uncle Frank—my father’s brother-in-law—stopped me in the middle of a story to tell the person beside him, “He’s just like Jerry, isn’t he?” My father had passed away two years before, so I took that as a huge compliment. Whenever something serious was going on, my father would crack jokes. This annoyed my mother to no end. Whenever something serious is going on or bothering me or bothering someone else, I try to make people laugh. This annoys my wife to no end, and it did my mother whenever she was trying to explain something to me or scold me. Whenever something serious is going on or he is being reprimanded, my son cracks jokes. This annoys his mother (and me, I have to admit) to no end. Of course, every time he does, my wife tells me don’t get upset, he’s just like you. None of us do this to belittle a serious situation. I have discovered that it is a defense mechanism. By interjecting humor into a serious or problematic or upsetting condition, we are trying to break it down into something that is more easily manageable. Believe me, we are taking it very seriously. Only we need to chop it into small enough pieces to digest. And not everything that is alike between us is annoying. Some are just down right cute. We’re talking head tilt to the side, followed by a quick intake of breath and a sighed, “Ahhh.” My father was a career Navy man. From birth to almost six, he spent a lot of time away on ships. Naturally, I was just a little bundle of excitement whenever my father came home. One time he came home I wanted to play, but he was tired and needed a nap—my father was a prodigy at napping. Something that is NOT the same between us. Sometimes, I think he may be almost as cute as I am. He might say different. The pictures below aren’t real close, in my opinion. 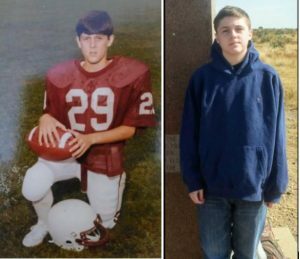 But the facial recognition on FB tried to tag the picture in my football uniform as my son. So I guess there must be some similarity. Me on the left. Son on the right. 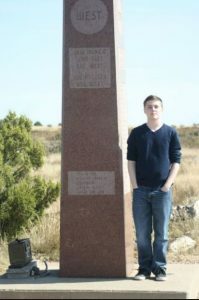 The marker for the highest point on Black Mesa in Oklahoma.